"Readers will want to carve out uninterrupted time to read this mystery in one sitting. Red herrings at every turn will have them guessing and flipping pages until the shocking end." 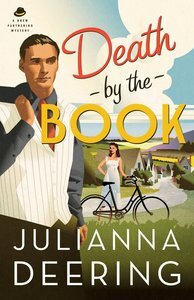 About "Death By the Book (#02 in Drew Farthering Mystery Series)"
Customer Reviews For "Death By the Book (#02 in Drew Farthering Mystery Series)"
I've always enjoyed Agatha Christie novels, as well as Georgette Heyer's 1930's detective romps. They are well-written with clever plots, interesting characters, and their 'contemporary' setting now reads as a delightful step into days gone by (well, delightful except for the body count). We get straight into the mystery when Drew visits his lawyer in nearby Winchester, only to find he has been murdered and left with a cryptic note stuck to him with an antique hatpin. There's no apparent motive, and no suspect. Chief Inspector Birdsong is again in charge of the case-and he doesn't want any help from Drew. However, the lawyer's widow asks Drew to look into the case, and he soon unearths some issues ...the murder mystery was excellent. As usual, I didn't guess the identity of the culprit, but in hindsight, the clues all make perfect sense. Recommended for mystery fans. Thanks to Bethany House and NetGalley for providing a free book for review.